Don Pongracz and Tim Arnold from Northwest Properties, with Chris Lawrence from Pronto Enterprises. The Irrigation Weather Station is shown in the background. 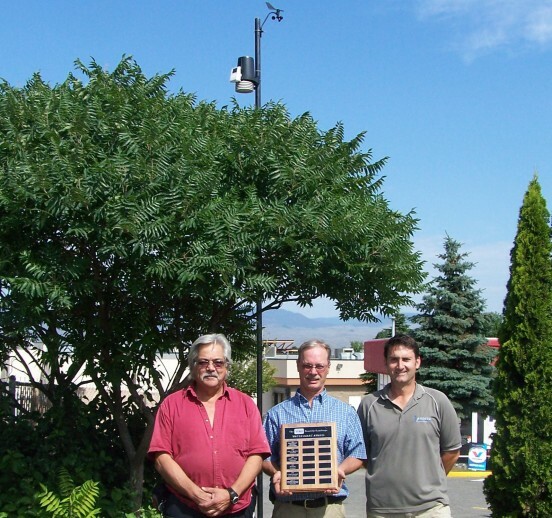 The Columbia Place and Columbia Square properties were awarded the Toro Beautify Kamloops Watersmart Award for 2011-12. The award was earned by the Kamloops Northwest Properties team by achieving an irrigation water use reduction of more than 50% for the combined centres over the past 3 years, as compared to the prior 3 years. This significant water use reduction was achieved while still keeping the shopping centre grounds in tremendous condition. Together with Pronto Enterprises – a local irrigation and water management company, who initiated the project years ago with the installation and monitoring of leading edge irrigation components, the Columbia Place / Columbia Square team have been successful finding better ways to manage water use at the shopping centre. Results like this take lasting dedication and a cohesive team effort, and are demonstrated through healthy green grass and lower water meter readings. Congratulations!